Eight studies from Daniel encouraging and challenging us to see things God's way. Eight studies. Leader's notes included. Christians with lower literacy levels who find other studies (such as the Good Book Guides or Interactive Bible Studies) too much of a stretch. Accordingly, the studies are designed to be short, straightforward and easy to use, with an uncomplicated vocabulary. At the same time, the writers have tried to do justice to the passages being studied and to model good Bible-reading principles. They have tried to be simple without being simplistic; no-nonsense without being no-content. The questions and answers assume a small group context but can easily be adapted to suit different situations, such as individual study and one to one. The leaders notes states: 'Questions have been kept deliberately brief and simple'. This makes it an ideal guide for my 'Lifegroup' with a group of new Christians who have just completed Discipleship Explored and some more mature Christains supporting the group. As an experienced leader it keeps me focussed on the main story line, gives me scope to tailor the material to the needs of the group and take into account other input the group is getting from the Sunday morning teaching, also based in Daniel. The leaders notes also give some ideas on where to focus if you need them. This guide is meeting my own expectations and we are enjoying discovering how much more in Christ we are able to put our trust in the living God. We used this in a small group of about 10 people most evenings. We did not use all the material ( a good thing) and were particularly interested in the later sections of the book. This was well covered and helped answer the "so what" questions. By studying the book of Daniel we learned deal about how to handle the scriptures as well as the book of Daniel. We were interested in areas of the bible that are not well known, because they are difficult. The later sections of the book fit this description! Studying Daniel did confirm the theology that all scripture is God breathed and useful for .... It is worthwhile struggling with the more challenging areas. How many other books/chapters/paragraphs or phrases have we missed over the years? Overall, a good study, well put together and certainly worth using in a small group setting. 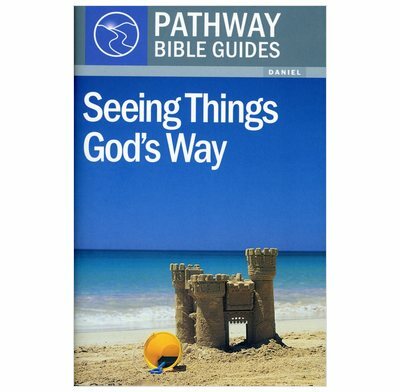 Seventy members of our church have studied "Seeing things God's way - Daniel." It has been inspirational to witness Daniel's wisdom and humility and God's faithful protection and guidance for his people through the exile. Many of our number would not have had the courage to embark on this bible book without the help of this guide. The amount of historical detail of the period of writing and of the events prophesied was well-judged for our understanding and needs. We have been encouraged to learn from Daniel's example of walking with God. We are privileged to know the promises made by God to Daniel fulfilled in the Lord Jesus Christ. Books I purchased really helps me with Bible studies. I just need to translate them in Latvian language and there sometimes I need also to change something, because in English Bible there are different words than in Latvian translation. But the main idea is always clear. This guide will significantly help anyone wanting to lead bible studies in Daniel. The format of a few simple but pertinent questions will provide a good framework for group discussion - they get to the heart of the passages without getting lost in the sometimes complex detail of Daniel. The short leaders notes at the back are an excellent summary of each passage, and give useful pointers for application. Daniel might seem too scary for inexperienced leaders but this book makes it accessible and relevant.